Brazilian prosecutors have requested the arrest of ex-President Luiz Inacio Lula da Silva in a money laundering inquiry. Prosecutors in Sao Paulo state said Lula should be placed in "preventive custody". They earlier filed charges accusing him of failing to declare ownership of a luxury sea-front penthouse in the seaside resort of Guaruja. Lula denies any wrongdoing and says the claims are politically motivated. The prosecutors said they were seeking the arrest on charges of money laundering for concealing ownership of the apartment. They said the request was based on an assumption that Mr Lula might try to obstruct the investigation. The request still has to be accepted or rejected by a judge. Lead prosecutor Cassio Conserino said the state inquiry was looking specifically into the ownership of the apartment. 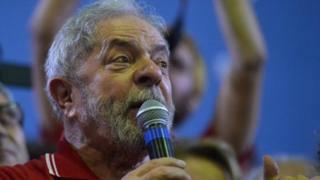 Lula, 70, denies all accusations and says he never owned the flat. His lawyer Cristiano Zanin Martins said there was a "media campaign" against the former president. "The owner of a property is the person listed in the registry. It doesn't matter who some people think it belongs to," Mr Martins said. He added that Lula had invested in the project, had visited the unfinished apartment but later asked for his money back rather than receiving property. Last week, Lula was briefly detained and questioned in a separate federal probe which is looking into whether extensive refurbishment on the penthouse constitutes favours in exchange for political benefit. The renovations were carried out by one of the country's biggest construction firms, OAS. In addition, federal prosecutors are looking into allegations that Lula has sold his influence in President Dilma Rousseff's administration in exchange for donations to his Instituto Lula non-profit foundation. Last week's questioning of the former president led to criticism not only from his supporters but also from judges and politicians, who said it was unnecessary. His supporters say the attacks on him are aimed at tarnishing his reputation, amid rumours that he may run for office again in 2018. Lula was Brazil's left-leaning president from 2003 to 2011 and was succeeded in office by his political protege, Dilma Rousseff, who has record-low approval rates amid a serious economic crisis. She joined hundreds of people showing support for the former president last Saturday. Lula, a former factory worker and union leader, remains a very popular figure in Brazil despite the accusations against senior members of his Workers' Party.